Jesuit Father Alex Bassili, socius to the Provincial of the Jesuits in Middle East Province, reported earlier today, Monday, April 7, 2014, at about 8 am, Jesuit Father Frans van der Lugt was been abducted by armed men, who beat him and then murdered with two bullets in the head, in front of the Jesuit residence in Homs, Syria. Father Frans van der Lugt (April 10, 1938-April 7, 2014) was born in the Netherlands and entered the Society of Jesus in 1959. He was missioned to Syria for the last 50 years working in education as a psychologist and in a project for handicapped people. 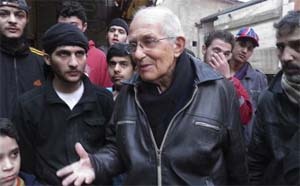 With the Syrian civil war Father wanted to remain with the local population in the Centre of Homs as a man of peace. Our Lady, Queen of Peace pray for Father Frans van der Lugt. Saint Ignatiius, pray for us.